Having a good pair of skateboarding shoes is as important as having a good skateboard. You’ll need to have good skate shoes to protect your feet from the pressures and impacts. Hence, we believe that all skateboarders should know a thing or two about choosing the right shoes for themselves. Our post covers all the essential information about skateboarding shoes so that all of you can decide which shoes are the best for you. These shoes are preferred by most skateboarder due to their flexibility. With a lower cut than other shoes, low-top shoes also tend to weight lighter, giving the users better comfort. However, because of the low-top design, the shoes don’t provide any ankle support. Today I would like to share with you all the skateboard tricks that I have compiled during my learning practice. I hope that you can use this skateboard tricks list as a reference for your development. These tricks are very cool to perform and have a mixed difficulty depending on your skills. You might even learn faster if you own a specific skateboard for tricks. These skateboards are designed for top performance and coolest movements, just right for YOU! So don’t miss this out and let’s jump right into my list! In my opinion, the flip tricks are the coolest among everything in my skateboard tricks list. The Rose 5 has been on shelves for a little while now, and although enticing, I decided to patiently wait for this release to hit stores before I made my purchase. A couple of weeks ago it did just that and I got myself to Footlocker on release day as quickly as I could to make sure I locked down one of the only 180 pairs that made their way into Australian stores. The limited ‘The Lake’ edition was a Europe/Asia exclusive, so when I found out to my surprise that they were hitting Australian shores, there was no way I was missing out. The Lake Michigan inspired kicks were also rumored to be dropping in Chicago, which makes total sense considering they are inspired by prominent Chicago landmark. From all reports they haven’t, which is quite puzzling and I know this has disappointed fans of the shoe that reside in the States. So with that said, the least I could do is film myself taking the kicks out of their cardboard home for the very first time and share it with my fellow sneaker enthusiasts and friends in Chi-town. I hope you enjoy the video and if you need a pair, I still might be able to help you out, as I know there are limited numbers still sitting on shelves here in Australia. If I were you though, I’d act quick. You know where to find me. What if I told you that Michael Jordan’s infamous Black/Red Air Jordan 1 WASN’T the actual sneaker that the NBA banned thirty years ago to this day? 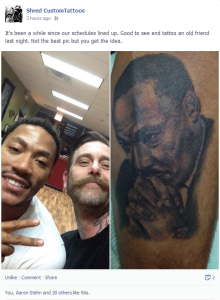 Like a majority of NBA players, Derrick Rose has quite the collection of tattoos. His collection includes the Chicago skyline and basketball on his hand, God’s Child written across his shoulders and of course the Poohdini wizard on his upper arm, among others. Yesterday he returned to Shred’s Inferno, the Westlawn tattoo studio where he’s had the majority of his artwork done. This is also the same studio that is owned and operated by my good friend Dave ‘Shred’ Kunesh who has also inked me on my previous trips to Chicago. As you’ll see below Shred added a portrait of Martin Luther King to Derrick’s collection, which is an accompanying piece to the previous Malcolm X work (see below) Derrick had done some time ago. Both are brilliantly accurate portraits that perfectly capture the characteristics and physical attributes of the leader of the African-American Civil Rights Movement and the Muslim minister. After the session was over Shred captured the moment on film and took to Facebook earlier day to share. Michael Jordan captivated us time and again with his basketball prowess, gravity-defying moves, and last second heroics. Many such moments are stamped in the minds of basketball fans worldwide. Melbourne based illustrator Chris Edser is an artist first and foremost, who also happens to be one such fan. Edser (originally from Adelaide, South Australia) was commissioned by Nike/Jordan Brand to create two pieces of wallpaper art highlighting two of Michael Jordan’s legendary on-court moments. Poison – tells the story of the epic ‘Flu Game‘ that unfolded in dramatic fashion in game 5 of the 1997 NBA Finals. The second piece entitled ‘The Last Shot‘ celebrates Jordan’s game-winning shot in the waning seconds in game 6 of the 1998 NBA Finals. A shot that clinched the Bulls their sixth title, had people partying in the streets of Chicago and crying in disbelief in Utah. Again. With each piece, Edser (and art director Daniel Whiteneck) illustratively breakdown what transpired precisely during each sequence. The use of time stamps and statistics to enhance the illustrations and tell each story is executed to perfection. The attention to detail is on point (check the XII’s and XIII’s on MJ’s feet) and the artists have captured the essence of drama within each amazing moment. Check out the work below. If you’re ever in Hong Kong, you can go see Edser’s work for yourself at the new Air Jordan store that opened in December of last year.